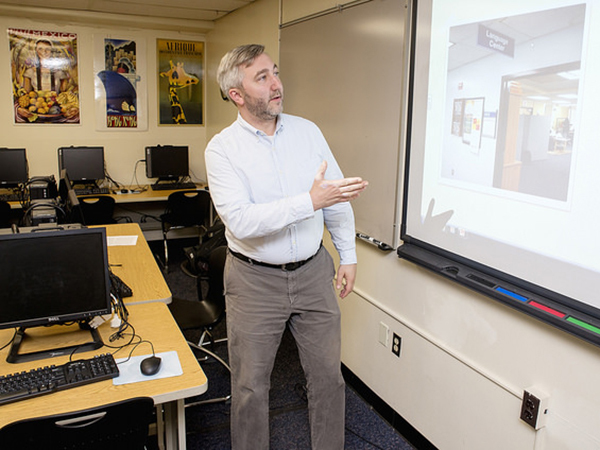 The Language Center assists students studying a second language at NOVA Annandale by providing them with resources and technology to improve their listening, speaking, reading, writing, and grammar skills. Our goal is to provide additional academic assistance to NOVA students. The Language Center boasts a diverse group of experienced tutors who are eager to help students maximize their potential. Our mission is to provide resources for the learning of languages outside the classroom. Students who frequent the Language Center show significant improvement with their listening, speaking, reading, writing, and grammar skills. There are many reasons to come to the language center, but you can come just to build a relationship, so that the day you're running late your teacher knows you, remembers you, and believes you because he or she knows you're an engaged and responsible student. One-on-one tutoring services of 50 minutes per week per student. The Language Center has a pool of dedicated student tutors who are ready and able to work with a diverse student population. Digital sound files that accompany the laboratory manuals or textbooks used in world language classes at the Annandale Campus. Supplemental software programs to support the development of speaking, listening, reading and grammar skills in the language being studied. DVDs for student use in the Center or at home. Dictionaries and other supplemental texts. Individual or small group study space. Workshops and conversation groups that can give students a chance to practice what they have learned in class. Conversation groups allow students to converse with other students in English about high-interest and relevant topics to students today. The Office of Disability Services has discontinued the provision of Extended Time Tutoring as an accommodation on students' MOAs. 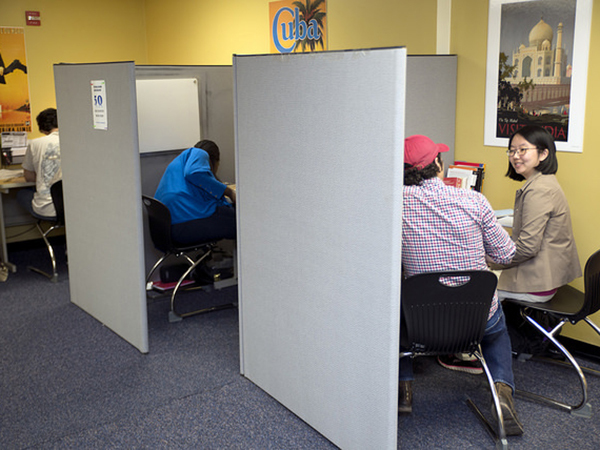 All NOVA students are entitled to the same amount of tutoring time, in accordance with individual centers' policies. This tutoring center uses Accudemia to schedule appointments and record student visit information. If you receive tutoring from this center, the email you provided for your account will periodically receive emails from an accudemia email account. You will receive an email upon account activation and as reminders for scheduled appointments. Other emails may be received based on usage and system updates. The authorized sender of Accudemia is noreply@accudemica.net. [H]ighly impressed with the tutors at the Language and Reading/Writing Center. Christine at the Language Center is Awesome! She helped me pass English 111 and English 112. I got an A with her help. Mina at the Writing Center did the same as well. I got an A with her help. I came in [to the Language Center] yesterday. I didn't have appointment, but your team made time for me. Ben was patient, kind and understanding. English is not my first language, not even my second language, I needed lots of help. I was worried if I was able to get it all done because my paper was long. He took his time, explain[ed] to me when he made correction and he stayed with me until we finished. When I was done I felt great because of him. He's wonderful and I am glad he's there. Visit our Blog and Meet the Staff! Faculty interested in having their students get to know the Center can request an orientation. A member of our staff will discuss our mission, goals, services, expectations for a tutoring session and much more! Please fill out our online request form. Need to Send a Student to the Center to be Tutored? Merit Software Access - Reading, vocabulary, grammar, and writing practice for intermediate to advanced ESL students. Rocket Languages - Speak and understand a new language faster. Need a login & Password? Stop by the Language Center to request one. 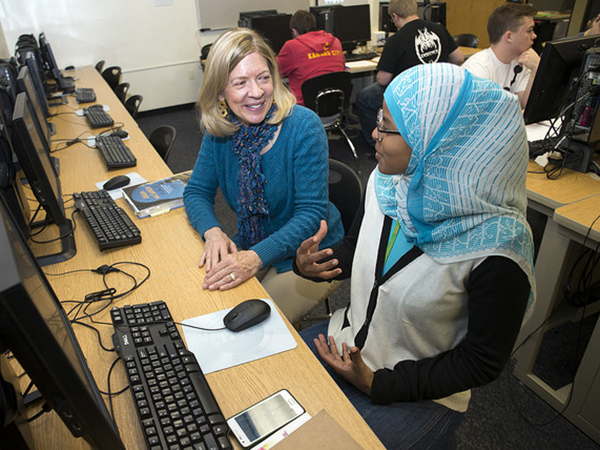 The Language Center runs a number of workshops for ESL and other language students. The Center currently offers Conversation Cafe workshops in CG-413. You do not need to make an appointment to join Conversation Cafe. Simply come to room 413 on the 4th floor of the CG building when club meetings are held. Thursdays: 11 a.m. - 12:00 p.m.
Wednesdays: 12:00 p.m. - 1:00 p.m.
Tuesdays: 1:00 p.m. - 3:00 p.m.
Fridays: 1:00 p.m. - 2:00 p.m.
Tuesdays: 10:00 a.m. - 11:00 a.m.
Wednesdays: 4:00 p.m. - 5:00 p.m.
Tuesdays: 1:00 p.m. - 2:00 p.m.
Mondays: 3:00 p.m. - 4:00 p.m. Conversation workshops often involve discussion of a main topic, group work and then the class comes together to share what they’ve discussed in their groups. Reading often involves building comprehension of a mainstream piece of writing rather than a textbook, and application of a reading strategy. Writing entails generation of ideas and writing for specified topics such as how to write a descriptive paragraph. Writing integrates grammar and writing exercises so ESL students can get a lot of practice writing in different formats. Drama is all about role-playing different scenarios ESL students may find themselves in, mostly humorous scenarios. Bring a pen and paper to all of our workshops. Will I have to pay for a workshop? No! All of our workshops are FREE to NOVA ESL students. No. Arrive on time for the beginning of your chosen workshop. All participants in the workshops are asked to attend on time and contribute actively to the learning environment. Participation is a must if you want to get the most out of these extracurricular activities. Below you will find answers to some of the more common questions asked. If you can’t find an answer here, please contact us at 703.323.3438. My professor told me that I need to go to the Language Center. What am I supposed to do there? What is the ESL Center? What is the purpose of the Center? Where is the Language Center located? Can any NOVA student use the ESL Center? How can I reach the Center? When are you open for tutoring this semester? It is difficult for me to come to the Language Center when it is open. Is there any way I can do my lab work at home? Where do I go to take a placement test and what should I expect? What happens at a tutoring appointment? Can a tutor write my paper for me? What sort of questions can a tutor answer? How many times can I get a tutorial? What is a Conversation Club? Will I have to pay to attend a workshop? What do I need to bring with me to a workshop? What software does the ESL Center have? Can anyone use the software? What do I need in order to use the software in the Center? Why are movies being offered by the ESL Center? Does it cost anything to watch a movie? Who is allowed to come and watch movies? I have an iPod/MP3 player/flash drive, etc. Can I copy/record/download audio materials myself from the Language Center computers? Most students who come to the Language Center choose to work with the audio materials that accompany their textbook or laboratory manual. These books often contain exercises that require students to listen to the audio materials in order to be able to complete them. The Language Center also has supplemental software and DVDs students can use to work on their listening, speaking, reading and grammar skills. Free tutoring is available. Tutors can assist you in improving your skills, helping with questions and doubts and providing opportunities for conversation. 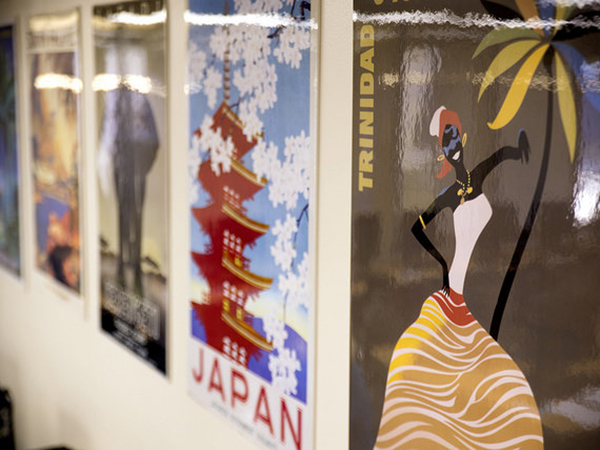 The ESL Center provides academic support to students currently enrolled at NOVA whose native language is not English. We offer a wide range of services from tutoring and workshops, to software specifically designed to teach ESL concepts. The ESL Center is located in the CG building, room 408 on the Annandale Campus. Any ESL student, past or present, from any campus, can use the facility. You can contact the ESL Center at: 703.323.3438. If you’d like to come in and make an appointment in person visit CG-408. The Language Center is run by the Center Supervisor, who coordinates our team of tutors and center support staff. Lab work is sometimes calculated as part of a student's full grade, therefore, students should be sure to talk with their professor about doing lab work at home. In order to take a placement test for Chinese, Spanish, French, German or Arabic, you should go to the Testing Center in CA-115. Foreign language placement tests are not offered at the Language Center. All placement tests are written tests and do not test a student’s listening or speaking ability. Tests are not timed, but students should allow at least an hour for each test. Test results will be sent to the World Language Department -- they will determine what class level a student should register. Tutoring is a 50-minute session where a student can work solely with a tutor, and work on any academic difficulties they may be having. The aim is to provide students with a contact for support and to help them advance through their academic studies. 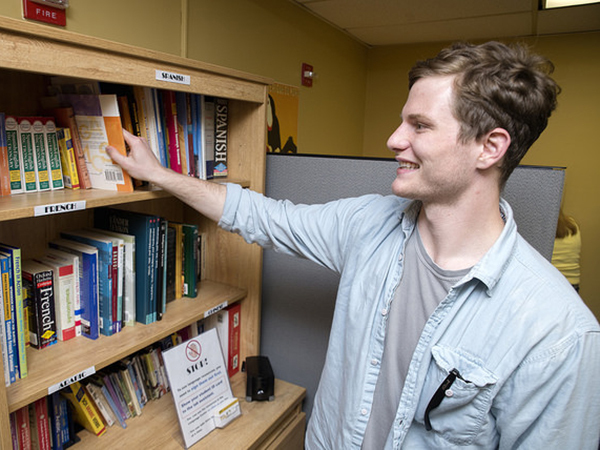 The Language Center has a wide range of tutors ranging from current NOVA students to community volunteers. Your tutor will meet with you and you will work together at an individual tutoring station. There you will discuss any current difficulties you may be having, or any questions you may have. Your tutor will ask you several questions, identifying what areas you wish to work on. They will also look over any materials you have brought with you and work out the best way to use your time together. Please remember that our tutors will do their best, but they may not be able to cover all of your concerns in a single appointment. Students are encouraged to make repeat appointments. We will do our best to keep you with the same tutor, who will continue to work with you throughout the semester. Please bring the assignment you wish to work on and instructions from your teacher. It is also a good idea to bring your textbook with you. We have a small selection at the Center, but not all of them. No. Our tutors will not write your paper for you, nor can they proofread any of your papers. They will identify key areas and common mistakes made by ESL students. They will also explain solutions so that you will be able to proofread your own work. Tutors can also help with essay structure and ensuring that you fully understand what the teacher is asking of you in each assignment. A tutor can answer questions you may have about grammar rules, structures of essay papers, vocabulary and even give advice for things such as exam technique and ensuring you are familiar with the class instructions. Come by our office located at CG-408. 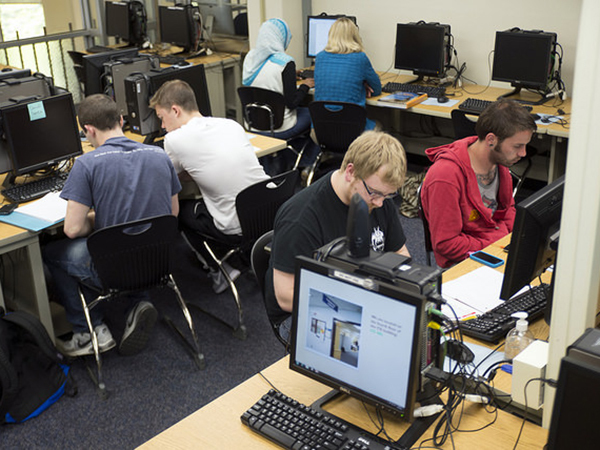 Each student is eligible for one free 50-minute tutoring session per week of the semester. Conversation Cafe is a great opportunity to practice your speaking and pronunciation skills with other Language and ESL students and an Language/ESL tutor. In these workshops, students are guided by the tutor to discuss cultural events and other topics together or in small groups. The aim is to share ideas and practice vocabulary learned inside and outside of class. Students are encouraged to bring things they would like to discuss to the workshop. There is no need to sign up, just come to CG-408. 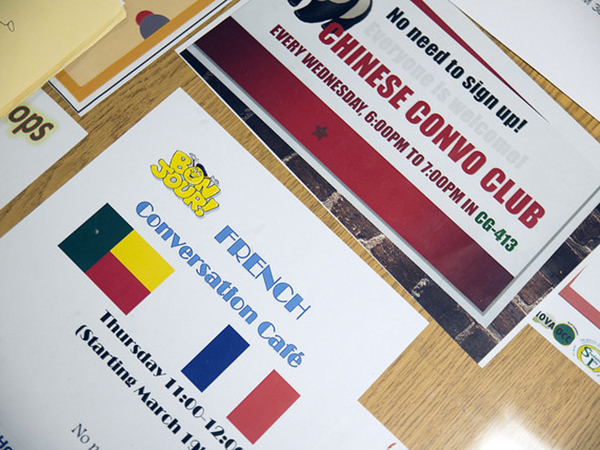 Days and times of various Conversation Cafe meetings will be posted outside the Language Center door. No! All of our workshops are FREE to NOVA students. Please see the software tab for a complete listing. Any student at NOVA may come and use our software free of charge. To access the software you will need to know your MyNOVA login and password. If you are unsure what yours is, please call IT Support at 703.426.4141 and they will be able to issue you with your logon information. Immersing yourself in the language you are trying to learn can be immensely helpful. Movies are a great way to gain familiarity with things such as idiomatic phrases, and see conversation English in action! Our group setting allows students to share ideas with one another after the movie has ended, as well as providing a good glimpse of American culture. It can help you build your vocabulary skills and confidence in speaking the English language. Announcements about movie times will be posted here on the website. No. All of our movie screenings are FREE to students! Any student is welcome to come and watch the movies. All audio materials in the Language Center originated from copyrighted works. 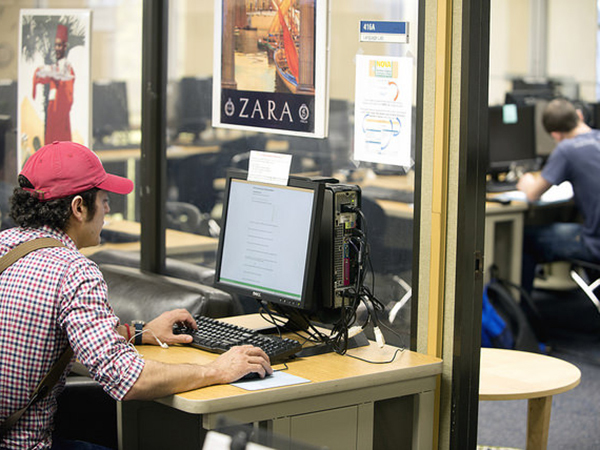 Students are strictly prohibited from using personal devices to copy, record or download any of the audio materials or software programs available for use in the Language Center. Monday-Thursday: 10:00 a.m. - 4:00 p.m.